A water feature is a lovely accent to a landscaped yard or flower garden. It provides a wonderful background for flowers and plants alike as well as providing the soothing sound of trickling water. 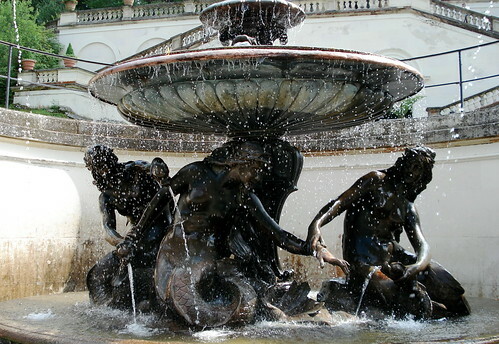 Most water features are marble, molded plastic or natural rock. The molded plastic water features are the lightest and easiest to work with but need special attention in climates where the water freezes over the winter. The fiberglass may become brittle and will break easily if hit or knocked. Marble, rock or cement fountains are much more durable in all climates but are considerably heavier and may be harder to install depending on the size you are planning to purchase. There are smaller freestanding water features that are self-contained and very elaborate in design. Self-contained refers to the fact that the water used in the fountain is collected in a bowl at the bottom of the fountain and recycled continuously. There are also more natural looking water features that circulate a large amount of water into a pond or small pool. These water features or waterfalls are more elaborate and require a longer time to build and install. 1. Level the area of the garden that you wish to place the fountain. 2. If it is free standing you will need to follow the manufacturers directions for securing the fountain. This may include partially covering the base of the fountain with soil or gravel. 3. If it is a natural waterfall style fountain dig the appropriate pool or pond space and insert the plastic liner. Mound the dirt from the pool and cover with rocks or stone to form the waterfall in the shape and height desired. 4. Hook the intake hose from the liner to the pump and the outlet hose from the pump to the top of the waterfall. 5. Fill the basin of the fountain or the pond of the waterfall to the appropriate water level. 6. Hook up the power supply to the pump. 7. Turn on the electricity and sit back and enjoy. It really is that simple to add the beauty of a fountain to your yard or patio. Most freestanding water features will come with the pump already included. Pumps are usually electrically powered and range in size based on the volume of water that they will be required to circulate. A small pump may be ½ horsepower and will circulate enough water to provide a continuous small stream in a yard or wall fountain. Large ponds require larger pumps. For water fountains located in lakes or ponds a submersible pump is needed. Pumps are rated on two components, maximum gallons per hour (gph) that tells you how much water the pump will circulate in an hour and maximum lift. Maximum lift will let you know how high the pump can push the water. To get the correct size pump make sure that you purchase a pump that will circulate a suitable volume of water up the distance from the pump to the top of the fountain. Most reputable pump manufacturers and businesses can provide this information for you. There are also classes and workshops available on installing and designing your own waterfalls and fountains. They are usually advertised at local green houses or landscaping stores.